Takata Airbag is the Biggest Recall in US History! Are you effected? See below if your car or truck is listed. Takata Corporation, a Japanese parts manufacturer, is responsible for millions of faulty airbags getting installed into cars that we share the road with every day; approximately 42 million vehicles are potentially affected. 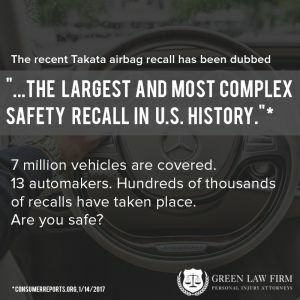 NBC News has reported that 11 people in the country have died as a result of faulty manufacturing, 180 individuals have been hurt, and over seven million cars have been affected by this now infamous auto recall. Is the airbag recall on your radar? If not, there’s a good chance it should be! We’re sharing the details, what you need to know and what to do if you believe you could be driving a car covered by the recall! What’s Wrong With The Takata Airbag Anyway? Propellant chemicals were mishandled and improperly stored during the assembly process, causing the metal airbag inflators to potentially burst from the inside out due to excessive pressure. Rust, bad welds, and gum (yes, chewing gum) had dropped into at least one inflator. Reports state that, in 2002, Takata’s plant in Mexico produced a rate of defects six or eight times above standard acceptable limits. For every one million parts shipped, 60 to 80 were defective. The Takata airbag recall has been in development for years. In 2014, the New York Times reported that the company knew about the issue as far back as 2004, when they (allegedly) issued secret tests to explore the problem; although they confirmed a potential issue, Takata never informed federal safety regulators, choosing instead to destroy data and get rid of the physical evidence. In short, Takata knew they had a problem – a big problem – and they didn’t move to protect people till it was too late. The history of the case is long and convoluted, with both Takata making strong claims and brutally defending themselves. What Cars Have Takata Airbags In Them? Now That I Know The Takata News, What Should I Do? First and foremost, check to see if your vehicle is covered in this recall. If it is, contact your dealer immediately. Dealers are doing repairs and replacements 100 percent free! While the wait times for replacement parts may vary, a recall means that you (the driver) has no liability or responsibility for the faulty part! 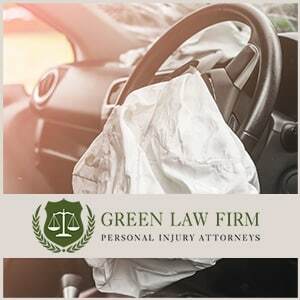 If you have been in an accident and you believe your airbag was defective and should have been included in the Takata recall, contact an attorney for help! Your case could be a complex, intensive and lengthy process; it’s to your advantage to have a car accident attorney working on your behalf! New updates happen in this case every day. As more automakers are added, developments are coming to light about knowledge Takata had about this dangerous situation! 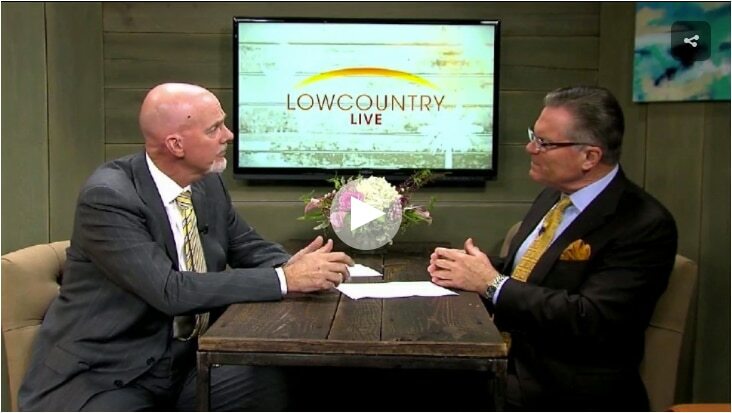 An experienced attorney can keep you updated and educated on what ways, if any, this recall affects the outcome of your recent car accident claim. This post on the Car and Driver blog which has a time-stamped chronical of recall updates, making it easy for you to follow developments from the beginning. Consumer Reports unbiased and action-oriented information on the full scope of the recall. The definitive website of information direct from the NHTSA, with a list of affected vehicles and timeline of events.